The MARSIS radar was deployed in 2005 and has been collecting data ever since. Jérémie Mouginot, Institut de Planétologie et d’Astrophysique de Grenoble (IPAG) and the University of California, Irvine, and colleagues have analysed more than two years of data and found that the northern plains are covered in low-density material. Two oceans have been proposed: 4 billion years ago, when warmer conditions prevailed, and also 3 billion years ago when subsurface ice melted following a large impact, creating outflow channels that drained the water into areas of low elevation. “MARSIS penetrates deep into the ground, revealing the first 60–80 metres of the planet’s subsurface,” says Wlodek Kofman, leader of the radar team at IPAG. The sediments revealed by MARSIS are areas of low radar reflectivity. Such sediments are typically low-density granular materials that have been eroded away by water and carried to their final destination. This later ocean would however have been temporary. Within a million years or less, Dr Mouginot estimates, the water would have either frozen back in place and been preserved underground again, or turned into vapour and lifted gradually into the atmosphere. In order to find evidence of life, astrobiologists will have to look even further back in Mars’ history when liquid water existed for much longer periods. 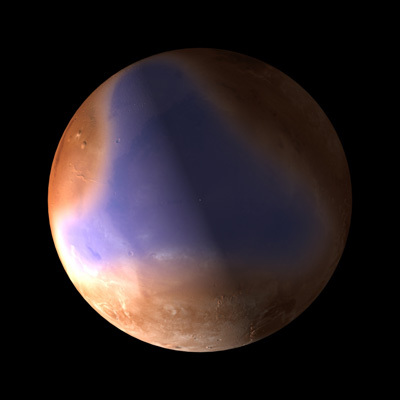 Nevertheless, this work provides some of the best evidence yet that there were once large bodies of liquid water on Mars and is further proof of the role of liquid water in the martian geological history. “Previous Mars Express results about water on Mars came from the study of images and mineralogical data, as well as atmospheric measurements. Now we have the view from the subsurface radar,” says Olivier Witasse, ESA’s Mars Express Project Scientist. 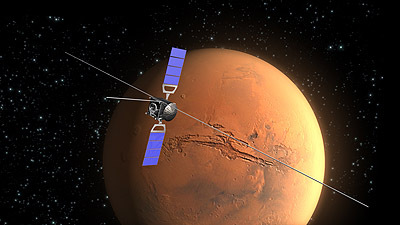 Mars Express continues its investigation.